The PS3 Diablo III outsold the Xbox 360 version globally in the first week of the console release, based on sales data from VGChartz. Because of the delay in reporting time, the sales data for the first week of console Diablo III in the United States and Europe was only made available this week. According to the VGChartz data, shown in the graphic above, the PS3 version of Diablo III sold 164,674 copies the first week of release, while the Xbox 360 version racked up sales of 147,186. That brings the total reported Diablo III console sales to over 311,000 for the week ending September 7, 2013. The sales for Diablo III on the Xbox 360 and PlayStation 3 varies substantially based on the country. The tracked US sales show the Xbox 360 version selling more in that country, while the European Diablo III console sales show higher sales for the PS3. Much of this is simply a reflection of the difference in the popularity of the PS3 and Xbox 360 consoles in various countries. The localized version of Diablo III for Japan won't be released until 2014 and then only on the PS3, since the Xbox 360 console has had so few sales in that country. The numbers listed in these charts should not be taken to reflect all of the sales of the console Diablo III. The data in these charts does not include all sales of a computer or console game. The difference between these numbers, and the actual sales of a game, can be seen by looking at the reported sales of the PC version of Diablo III. The original Diablo III on the PC is listed at VGChartz as having sold 2.4 million copies in the first 10 weeks of release, back in May-July 2012. In fact, the full sales of Diablo III PC at that time were in excess of 10 million copies! Some of the difference is from digital copies that aren't shown in retail sales at all; the PC version no doubt sold more digital copies than the PS3 and Xbox 360 versions, but there are still some digital sales on console, and other retail sales that aren't reflected in these particular charts. We won't know the total console Diablo III sales figures until Blizzard decides to release that info. 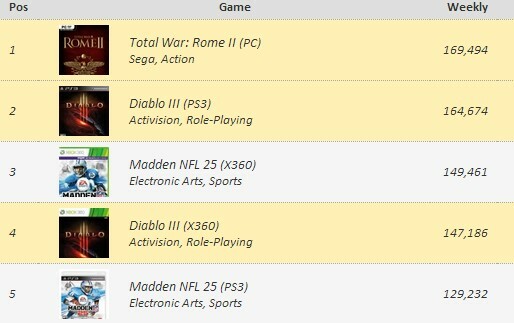 Between the numbers here and the sales reports from Amazon.com, it appears that Diablo III on the console had solid but not spectacular sales in the first week of release. The strong word of mouth during the first weeks of console release, along with positive reviews, should lead to decent continued sales. As seen at Metacritic, reviews averaged 86 out of a possible 100 for both the Xbox 360 and the PlayStation 3 versions. It looks like the big leap for Diablo III from the PC to consoles has landed remarkably well.